a. EG was much wealthier than NK is now. EG was the ‘leading’ economic performer of the east bloc. The USSR realized how central the German competition was to the overall Cold War competition, so EG was heavily subsidized. NK was never as important, because the cold war contest was never as stark in Asia as it was in Europe, so NK never got such big handouts. NK’s GDP/capita today is a crushing $1700; EG’s in 1989 was $10,000. b. NK is not just a dictatorship; it is an Orwellian nightmare, more stalinist than even the Soviet Union or Albania ever were. 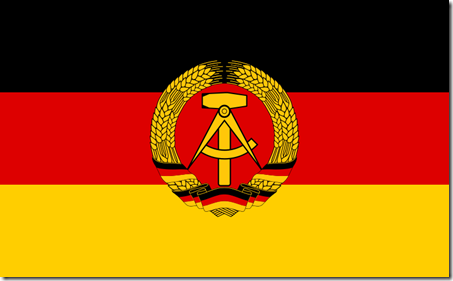 East Germany was bad but never plumbed the depths of repression and madness like NK. One of our faculty at my university works with NK defectors, and he notes how many of them have psychological trauma from life in NK. Fixing NK will not just be a huge pile of money; we know that. It is also going to require something akin to nation-wide psychiatric care for millions of mentally brutalized Winston Smiths. This will be an event unheard of in the annals of mental health; read here and here. c. On just about every other benchmark conceivable, NK is worse off than EG: environmental management, infrastructure, labor productivity, health care, education, technology, etc, etc. The per person cost of Korean unification is likely to much higher, because NK is so much further behind in almost every way than EG was. Estimates of Korean unification could begin with these figures: in 20 years, WG has transferred $1.2 trillion euros to the roughly 16 million people of EG at the time of unification. Note than NK has more people (23 M) than east Germany, and those people are significantly poorer per person too ($10k vs 1.7k per capita). So that means the 1.2T euros figure is likely too low for the NK case. Note also that West Germany had around 60 M people in 1989; SK has 49 M today. WG’s 1989 GDP per capita was $25,000; in SK today, it is around $19,500. The arithmetic is punishing. d. EG and Soviets did a good job deceiving the world that EG really was modern and advanced, just like the West. This is one reason why the WG government granted 1:1 currency convertibility to the GDR mark: almost everyone thought EG would have some reasonably competitive industries and sectors. Yet when WG finally got in there – when the West finally pulled the lid off – almost everything was badly behind or unusable: the phone system had to be completely replaced, EG cars were a polluting environmental nightmare, laborers had no idea how to use computers or even basic office devices like photocopiers, infrastructure around the country still had World War II battle damage (that is no joke, I saw it), etc. So it’s likely that NK is much worse than we think it is. Even Bruce Cumings has admitted this. Yes, try to imagine that: NK, our customary endpoint of geopolitical awfulness, is probably hiding much worse than we know now. Once we see the NK gulags up close, I think we are going to see Nazi-style atrocities even the Taliban wouldn’t have tried. e. SK is less politically prepared to carry the enormous stresses of unification – and not just the financial burden. The SK political system is flimsier than WG. Corruption is more regular; its parties are shallow and change names quickly; political unresponsiveness drives a street-protest culture and brawling in the National Assembly. For a state that came out of dictatorship less than a generation ago, SK is doing pretty well, but it clearly does not have the state capacity WG did in 1989, while it faces (points a & c above) a comparatively greater burden. Indeed, this is my greatest fear – the burdens of unification will simply overwhelm SK’s still maturing democracy and leave NK in some kind of semi-annexed limbo like the West Bank. a. In 1989, the US was at peak of its postwar relative power. The USSR was in decline; China was still far off. This is the era of the ‘unipolar moment’ and the ‘end of history.’ Today the balance of forces is very different. The US is much weaker. Many think the US is in decline. All this makes it harder and harder for the US to support SK in any contest with China or NK over unification. It is likely that SK will have to do more of the work on its own, compared to the heavy intervention by the Bush 41 administration to support the WG position. The weakened American position means it will be easier for China to dictate its terms for unification (such as no US forces north of the current DMZ, or perhaps even no US forces at all). b. In 1989, the USSR was a mess; today China is not. The GDR’s patron was imploding. It could no longer afford the contest with the US. The Soviet Union was trying to geopolitically retrench and to re-starts its moribund economy with perestroika and glasnost. The Soviets were getting desperate, and the east bloc – subsidized as it was – had become an albatross. Gorbachev was fumbling to control all the forces unleashed. China is the opposite. It is not overextended, but rather just beginning the international expansion that flows from its rising strength. It is feeling its oats and ready to give the US a run for its money in Asia at least. Tiananmen Square demonstrated a non-Gorbachevian willingness to roll out the tanks to maintain the one-party state, and there is no serious liberalizing force, in part because the Chinese population is being bought off with growth. So China is much more capable of carrying the NK albatross and ready to push its interests into Korea not pull out per Gorby. Since we are talking about Cold War stuff, have any of you seen the European 5hr30min mini-series on Carlos? Fantastic stuff. It won a Golden Globe. The part on Carlos and the PFLP taking the OPEC ministers in Austria hostage was very well done. They also have the Japanese Red Army Faction in the series. It is now playing on the Sundance Channel. In addition I bought a DVD copy of the BBC mini-series “Smiley’s People” to compliment my copy of “Tinker, Tailor, Soldier Spy” over the weekend. Sorry to go off mark but another great recent independent Cold War movie is the German film “The Baader Meinhof Complex”. Also talking about “Carlos”, the film explores his Stasi, ETA, Libya, Iraq, Sudan, PFLP, and German terrorist connection at lenght. Great stuff. The movie is multilingual, French, German, Spanish, German, Arabic and English. Also, Dr. Bob, did you catch that Marcus Wolfe (the man without a face) the master Stasi spy-boss died last year?